Texas Academy of Dance Arts (TADA) presents its first annual Garden Party. A magical experience for the whole family, TADA’s Youth Ballet Company invites families from all over Houston to a delightful afternoon luncheon with the performers of TADA’s spring ballet production of The Sleeping Beauty. 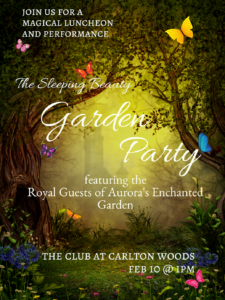 The Sleeping Beauty Garden Party will feature fun activities for children, fabulous vendors, a silent auction, an elegant luncheon with the performers, and whimsical dancing from the characters of The Sleeping Beauty. Choreographed by TADA’s Ballet Director Elise Elliott and performed by members of TADA’s Sleeping Beauty Cast and Youth Ballet Company, audience members can expect to enjoy a short performance that previews the company’s newest production, which will be performed at the Crighton Theatre in Conroe on March 3rd. The event will culminate with an exciting surprise due to enchant all the little ones attending the event. Tickets are on sale now at www.tututix.com/DanceTADA at the price of $70 per person. Proceeds will go to the production of The Youth Ballet Company’s presentation of The Sleeping Beauty. Seating is limited, so purchase your tickets now to join us for an enchanted afternoon. The Garden Party will take place at The Club at Carlton Woods on February 10th at 1PM. « Best of Fringe 2019 Applications Open!